Christmas may be over, but there’s no harm in keeping that tree around a few days longer. Breathe in its earthy aroma, relive the fond memories of family, friends and food and play with Santa’s deliveries, of course. However, if you are keen on cleaning out the old to make way for the New Year then please consider returning your tree to the Scouts Xmas Tree Chip-Up event. The trees are chipped and recycled with all proceeds in support of youth in our community. Donations are also graciously accepted! 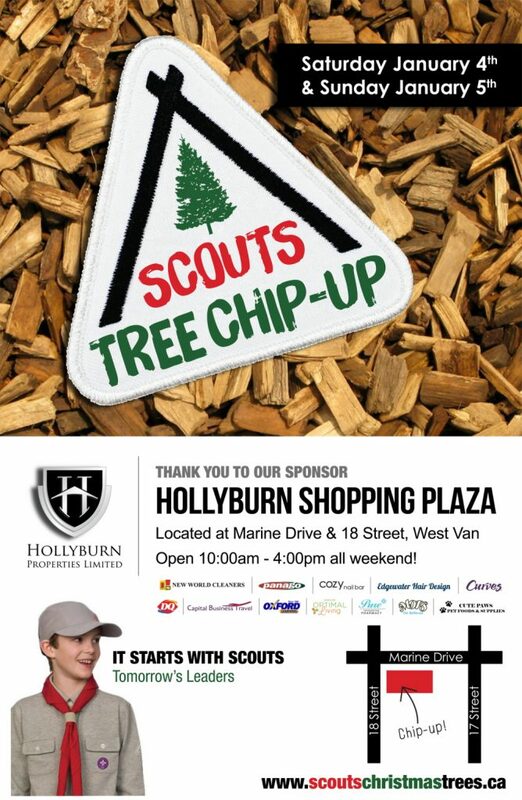 In addition, every customer of the Chip Up will receive a coupon booklet for savings at the commercial businesses in Hollyburn Plaza, the location of the event. Think Curves, chiropractors, cleaners and chicken strips!